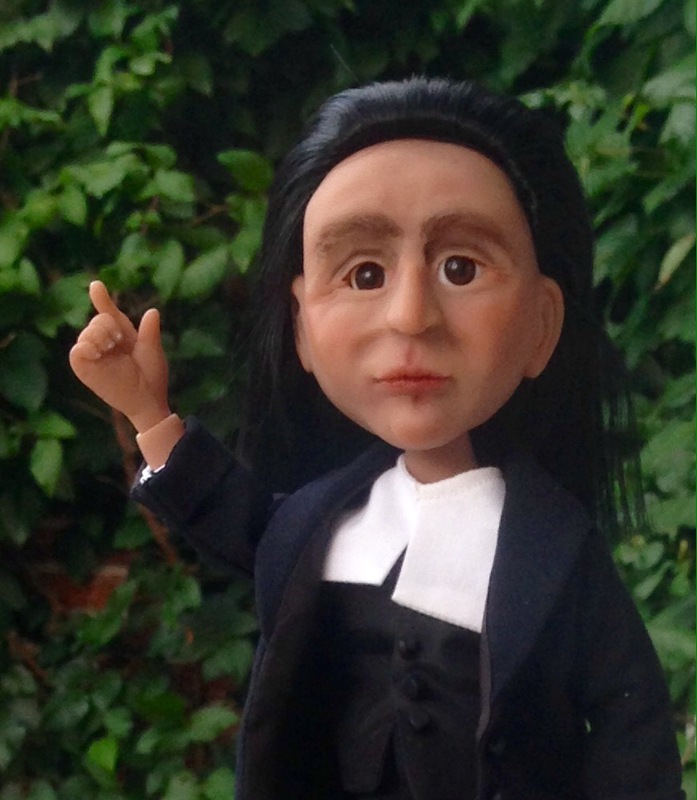 In 2016, multi award-winning doll artist Judy Porter was commissioned to sculpt and create 20 ball jointed dolls (BJD) after the likeness of Samson Occom (1723-1792), the Mohegan / Brothertown Native American minister. These dolls commemorate the 250th anniversary of Occom’s mission trip to England (1765-1768). They are meant to raise awareness for Occom’s life and the Brothertown Indian Tribe which he helped to found and, by extension perhaps, awareness for all Native Americans. Each 11″ resin doll is dressed in typical period-style minister’s attire including breeches, shirt, vest, frock coat, minister’s collar, socks and buckled shoes. Each doll is numbered, signed by the artist, and includes a Certificate of Authenticity (COA) and info sheet. Some of these dolls have been spoken for by Brothertown individuals. Others, it is hoped, will go to cultural and historical society museums along with a display case and miniature items that tell the story of Occom’s life. A very small number of dolls are being made available to the general public. This doll is slated to be featured in the September, 2017 issue of Dolls Magazine so availability may not last. If you are a nonprofit museum or group and are interested in displaying this doll at your location, please go to the “Donations to Nonprofits” page. If you are an individual looking to purchase, please visit the “Collectors” page. A special thank you to Mrs Caroline Andler, Amy, Lucinda and Henry Medford, Suzette Fell-Buhr, and Tasha Thompson Martinez for their contributions in the creation of this doll and/or his accessories. Below are photos and more information on Samson Occom. Samson Occom was born in a wigwam in present day Connecticut in 1723. He was a Mohegan Indian who converted to Christianity in his late teens, received an education from the Reverend Eleazar Wheelock and went out among his brethren with the dual intent of converting and educating them. This, he surely hoped, would help them to be able to persevere and thrive alongside the European Colonists. Already, the population of the Indians on the East coast had been decimated by war and disease brought over from Europe. Their food supply and all other resources were so reduced from the overtaking of their lands that it was easy to see that they could not last long if something were not done for them. In 1765, in an effort to serve his people and to answer what he felt was God’s call, Occom sailed to England to help raise funds for Wheelock’s Indian Charity School. He spent 2 ½ years preaching and raising money all across the United Kingdom. He was well received and helped to collect the equivalent of about 2 million dollars by today’s standards. When he returned to America he found that Wheelock, instead of living up to his promise to care for Occom’s wife and children in his absence, had left them destitute. Later, the school he had helped to raise funds for and expected to be built in CT and educate Indians, was moved to New Hampshire and educated mainly whites. Occom felt this was a serious misuse of the funds the donors had entrusted to him and a rift began between he and his mentor which never really healed before Wheelock’s death. Toward the end of his life, Occom was involved in the migration and formation of a new tribe amalgamated from remnants of 7 Native “praying towns”. This new tribe began in New York on land given them by their elder brother, the Oneida. Occom noted in his journal entry of November 7, 1785, “…we named our town by the name of Brotherton, in Indian Eeyawquittoowauconnuck”. In the 1800’s, after again losing too much land to settlers, the Tribe moved to Wisconsin where they eventually petitioned for US citizenship to avoid yet another relocation. The Brothertown Indian Nation is currently headquartered in Fond du Lac Wisconsin and awaits Federal re-recognition. Occom died on July 14, 1792, but his contributions continue to be felt to this day. His hymns are still sung, he is honored with a feast day in the Episcopal Church, his numerous journals, letters, and sermons are studied in countless colleges and universities, and several Native American Tribes have been helped by his writings in their re-recognition process. He was an integral part of the founding of Dartmouth College (the school created with the funds he helped raise), father of numerous descendants, and a co-founder of the Brothertown Tribe. Yet, for all of his service, notoriety and importance, Samson Occom still rests in an unidentified grave in the woods in Oneida County, New York. Click here to read Occom’s autobiography.